Credit unions and banks are constantly striving to drive new accounts opened, products per customer and overall sales through marketing efforts. 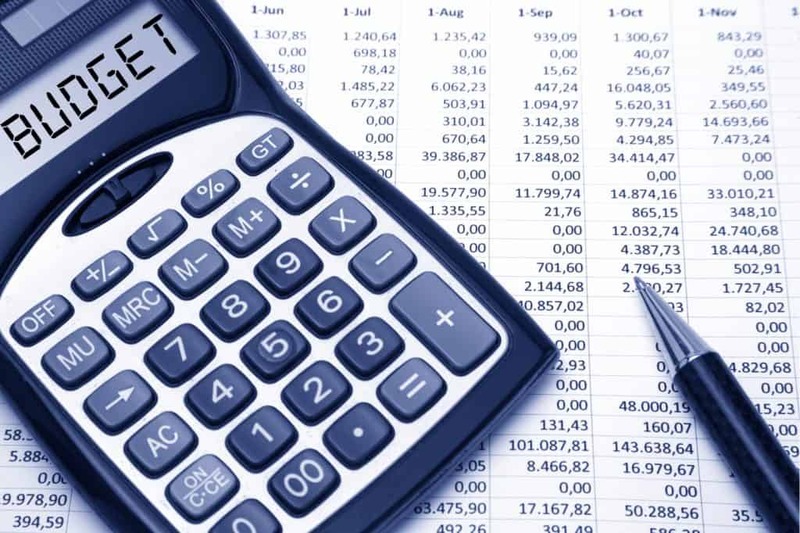 In 2017, banks spent an average of 6% of total revenues on marketing and advertising expenditures, while in 2018, annual marketing budgets are expected to increase by nearly 8.1%. Optimizing marketing spending in the financial services industry requires constant adjustment as marketing channels evolve. A wealth of emerging technology has also prompted financial institutions to re-work their budgets and explore new approaches. But where do you start when it comes to constructing your institution’s marketing budget and how should that money be spent? Analyzing detailed records of your previous year’s spending is a good starting point to building your new marketing budget. What worked and what didn’t? Were you able to meet objectives working with your previous budget? Last year’s performance can help you asses what to focus on and where to cut back. The information and trends found within your spending can help guide your budget plan for the upcoming year. Each organization varies on their spending. Factor in size, location and competition, and you’ll notice that not all budgets are comparable. But finding an institution that works similarly to yours can direct you to what areas of your bank or credit union can use your attention. The Financial Brand suggests allocating roughly 0.10% of assets to marketing for banks that want an industry average investment. But if you’re looking for aggressive growth in your institution, then budget accordingly and support your plan with the appropriate marketing needed to achieve that goal. Prioritizing your goals before defining a budget will help guide you to where you need to be in your marketing spending. Are you trying to attract new, young customers or retain current members? Institutions report that on average, 63% of the marketing budget is focused on customer retention, while 37% is for targeting new customers. For example, if the goal of your credit union is to target the Millennial or Gen Z market, then portion out part of your budget to include the use of mobile apps and social media, as this young audience seeks a convenient, real-time experience provided by modern technology. Digital spending remains on the rise, with two-thirds of marketers expecting to incorporate digital marketing channels in their budgets in the coming year. 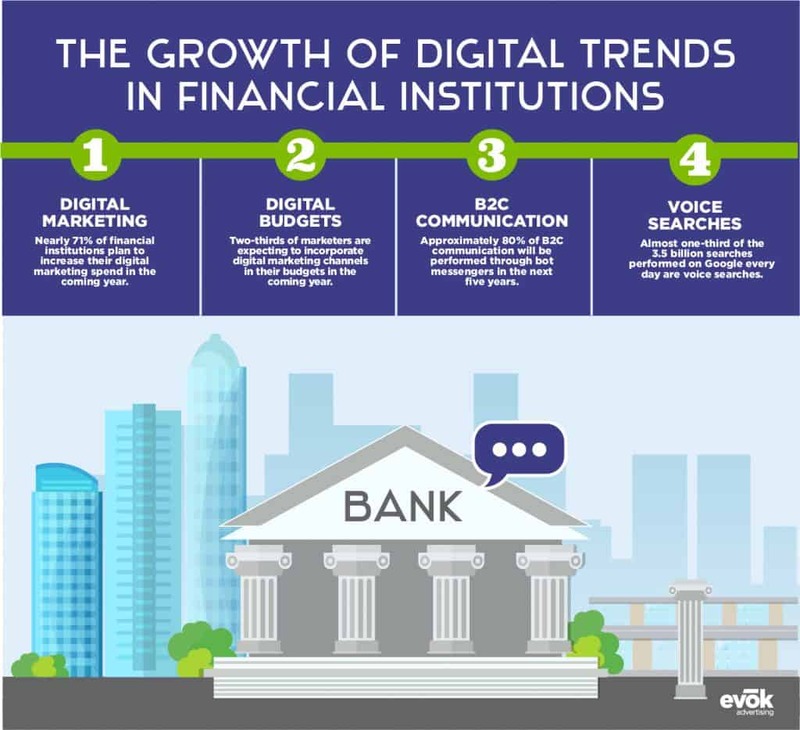 Financial institutions are toning down the use of traditional advertising such as print, radio and TV, and toning up the use of digital advertising such as SEO strategies, social media engagement and the convenience of mobile app features like mobile payments and deposits. Marketing automation tools allow financial institutions to scale their marketing efforts and run relatively measurable marketing campaigns while saving your institution’s money in the long run. Automation tools can be used for email, social media and other website actions. According to Garner, investments in marketing technologies now make up 29% of all marketing budgets, making it the single largest area of investment. 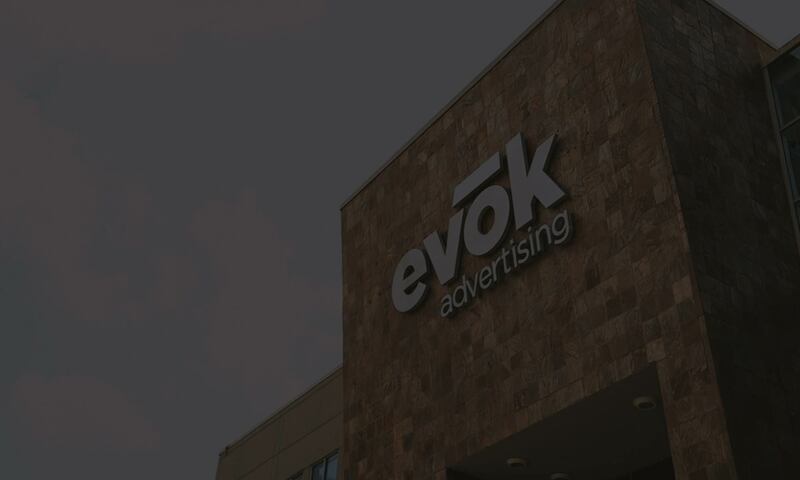 Marketing automation software—like SharpSpring, evok advertising’s choice in email platform—allow you to implement behavioral-based email automation, engage customers with customized landing pages based on visitors’ interests and attributes, and send automated reminders, promotional offers and more. Studies show that 48% of consumers expect specialized treatment for being a good customer, and 33% of those consumers will abandon a business if it lacks personalization. Consumers crave personalized experiences, and today’s technology, analytic tools and everchanging media environment enable financial institutions to deliver to these consumer cravings. Use a personalized cross-selling strategy that builds audience personas for better relationship banking. Building an audience persona means more than just hitting traditional data points. You should understand your customers’ purchase behaviors, social interactions, life stages and even insights like health and key life events. Fortunately, almost two-thirds of households are willing to share highly personal information if it returns value. While there is no denying that the customer journey in financial services is important, the value you provide to your customers is what brings loyalty. 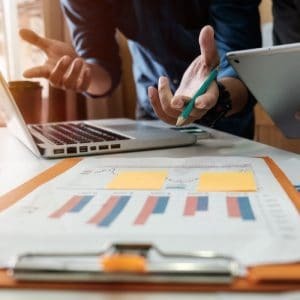 Your marketing budget should consider what value it can bring while connecting with your target market’s unique pain points and motivations. Look back at how much you’ve spent in the past and look forward to how much you’re willing to spend in the future based on your set goals. Diversify your marketing tactics and plan for those tactics in your budget. You may just reach your target audience through new acquisition channels in new places. Is It Time for Your Credit Union to Hire an Advertising Agency?